Ivanka Trump needed "guidance" to know government officials are not supposed to use a private email account for government business? Did she sleep through the "Lock Her Up" chants during her father's presidential campaign rallies? Hillary Clinton illegally used a private email server to conduct government business which, Donald Trump insisted, made her not only unqualified for office, but someone who should be prosecuted. Ivanka's attorney Abbe Lowell insists that no classified information was included in the emails and that all of the relevant ones have been turned over. That is exactly the position Hillary Clinton took as to her emails. Even if true, it is still a violation of the public record keeping law to use a private email for public business. It should be noted that Ivanka set up this private joint email account with her husband, Jared, after her father's election. It was not a long time email account she was using for convenience sake. It could well have been established before starting public service, just as Hillary's email was, to avoid public scrutiny of her work in government. 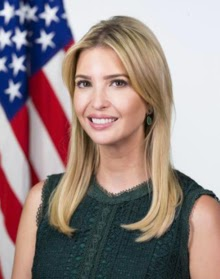 On the Morning Joe show this morning, the position taken by hosts and panelists is tha, even though Ivanka is a smart woman, she is ignorant of how government works and thinks she is above the law with which other people have to comply. I agree the Trump family members have repeatedly demonstrated that they believe they are above the laws that apply to everyone else. I do not, however, agree with the premise, i.e. that Ivanka is a smart woman. One thing that Donald Trump and his siblings, Ivanka, Don, Jr. and Eric, have demonstrated beyond any doubt is that they are not the sharpest tools in the shed. This is exactly the same type of nonsense that Indiana pulls that you and the late great Gary Welsh have spent so many years discussing. This crap needs to end.